The Injury Free Coalition for Kids of Birmingham, Alabama focuses on injury prevention in the West End sector of the state’s largest city and county seat of Jefferson County. The Children’s Hospital of Alabama, home of our Injury Free, is the pediatric referral center for the entire state but receives the majority of patients from the Birmingham, Jefferson County and contiguous county areas. The West End sector population provides a significant share of the hospital’s outpatient and inpatient census and is an area of lower socioeconomic, minority citizenry. Injury Free injury surveillance data suggests West End is also an area of high injury incidence. Injury Free of Birmingham has established a partnership of the Children’s Hospital, Jefferson County Department of Health, Chris McNair Health Center, Safe Kids of Alabama, Think First (head and spinal cord injury prevention program), the Southeast Child Safety Institute, the Birmingham Regional EMS service and the West End Community Association. This coalition facilitates access to children through well child visits, acute care visits, church, schools and neighborhoods. Guided by local hospital surveillance information, we are focusing on burn injuries, bicycle-related injuries and poisonings. Educational poison and injury prevention materials are being developed in both English and Spanish languages for community-wide distribution. We are working to improve burn care follow up, an area of need identified by earlier research. Bicycle helmets are being distributed in our intervention area along with bike safety resource packets for local area leaders. In conjunction with the local Headstart program, we will offer a Injury Prevention Fair this spring. This will consist of multiple stations of interactive educational experiences for the children of the neighborhood. Some of these stations will include: pedestrian safety interactive experience, home safety Velcro game, poison control game, Smoke House interactive experience, water safety activities, and a bicycle rodeo. 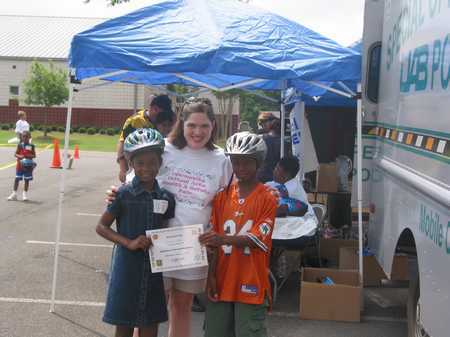 We also plan to distribute and fit bicycle helmets and booster seat give-aways. Families attending will receive a free smoke detector and instructions for proper installation from our local fire department. There are currently no events listed for Birmingham.